Home Cookbook Review Best Cookbooks for Teens- How to Get Teens into the Kitchen! What’s the best way to get Teens to eat good food? Have them make it themselves! The Best Cookbooks for Teens have some great recipes… made with fresh ingredients… that teens will love. They are more than just books. These are lessons in independence and healthy living. Teach a teen to cook… and they won’t have to rely on Fast Food. They will learn to that they can create flavors that are both nutritious, budget friendly, fresh and healthy. Plus, they get to play with knives and fire… what teen can resist that? Teach a Teen to Cook Fish, and He will Eat it Forever….. I love the writing style for this Cookbook. Written by Teens, it’s kind of conversational without being overly annoying. The Authors, Megan and Jill Carle, write the way they see it. Ingredients are discussed, and techniques are explained in simple lessons around the recipes. The limitations that come when someone else is in charge of groceries comes up. The recipes are solid… good, delicious, interesting…. familiar, yet there are some new flavors here for teens to try. The emphasis of Teen Cuisine is Fresh Food from Scratch. This might be the perfect cookbook for a teen who’s had a bit of experience in the kitchen, and now wants to stretch their culinary wings a bit. 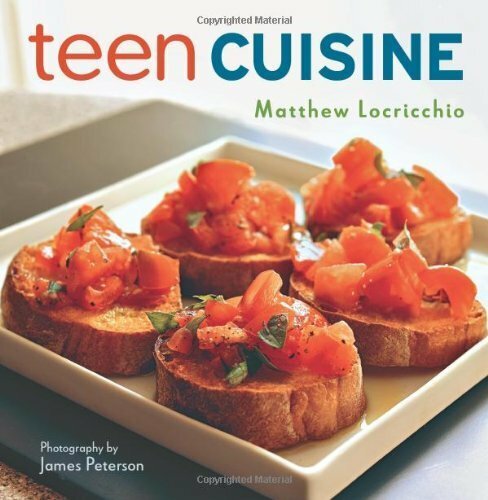 Matthew Locricchio teaches teens to make it all from scratch, no pre-mixed or pre-packaged ingredients. The results though, are fantastic. Flavorful and beautiful. Perfect for today’s teen with an adventuresome palate. 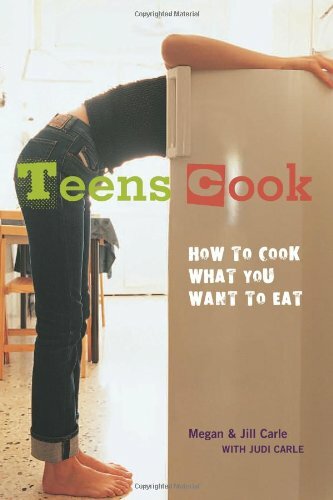 Lots of photos, lots of basic instruction, graphics of different cooking tools, and a glossary of food terms make this book a great one for a teen cook. 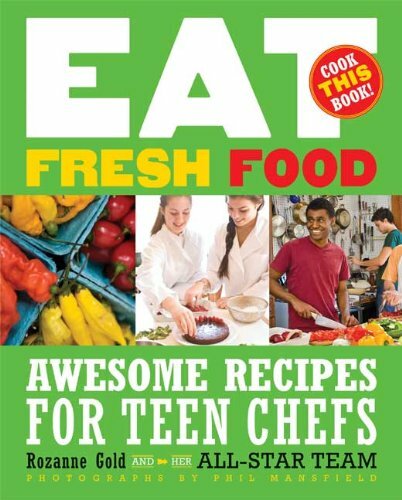 Loaded with Photographs, Rosanne Gold and her All-Star Team, have put together a great cookbook for Teens with special emphasis on using Fresh Ingredients. This is not just a snack food cookbook… this book is about creating meals, for all times of day, using the best ingredients you can afford. Teen style. Step by step photos of teens making the dishes lure you in to wanting to make these foods! There is heavy emphasis on healthy eating, and loads of the recipes are vegetarian. Some teens are turning to Vegetarianism, for health or environmental reasons. In some households this means they end up just eating side dishes, or lots of peanut butter sandwiches (my sister lived on pasta and peas for a year… awful). 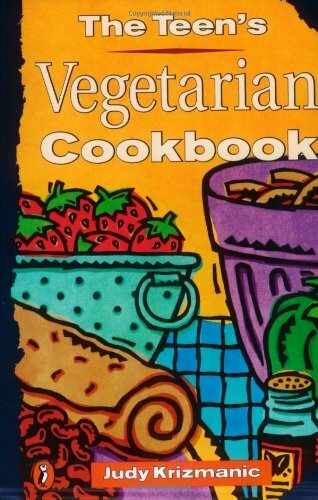 This cookbook not only teaches teens how to prepare a variety of vegetarian dishes, it also has charts explaining food-combining and nutrition that is so important for a growing teen body. The recipes in this book are straightforward, delicious, and interesting enough for the non-vegetarians to want to share.